“BIM has been in flux over the last year with predicted growth not met. However, 19% of professional CAD users and managers across all industry sectors now use BIM and that is forecast to grow to 29% in the next 3-5 years. BIM current and future usage unsurprisingly will continue to be dominated by the Architecture, Engineering and Construction (AEC) sector. 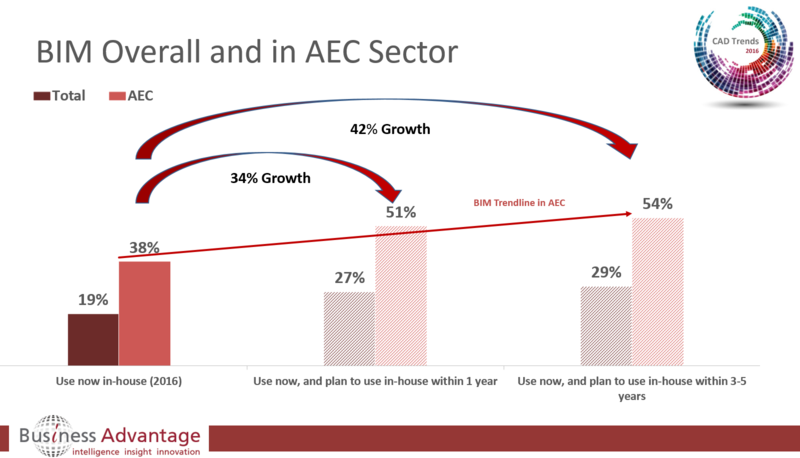 In the AEC sector 38% of respondents use BIM now, users predict 34% growth this year to 51% using BIM.” – Chris Turner, CEO of Business Advantage Group. BIM continues to be a very significant trend in the CAD market, the 7th most important of the 15 studied in this year’s report and one of the leading trends as it has both ‘high importance’ and ‘high usage’. Interestingly there is 5% usage of BIM in the Manufacturing sector and that is expected to increase to 10% in the next 3-5 years. Current BIM usage is highest in large companies (30%) and about the same in medium sized (15%) and small (13%) companies. By Region, current BIM usage is highest in EMEA (22%) and N. America (20%), followed by APAC (11%). Obviously the BIM trend moves users from 2D drawings to 3D models and we wondered therefore if the importance of 2D drawings is diminishing. The survey asked, “How important to your company are 2D drawings which are automatically (either fully or partially) generated from 3D CAD or BIM models?” 45% of AEC users report that the importance of 2D drawings has not changed, 27% report a net decrease in importance and 23% report a net increase – so the main message is that the overall importance of 2D drawings remains the same and is not diminishing as a component of AEC design. Informative article on BIM, but looking back and evaluating, BIM has certainly got a technology up curve leading to high performance buildings & greater efficiency. 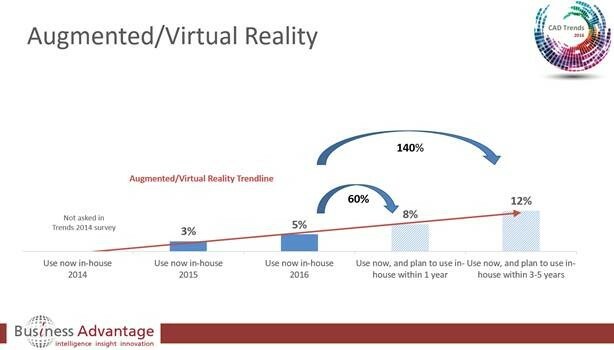 The present scenario in 2018 and moving ahead would be BIM integrated with Artificial Intelligence, Generative Design, Algorithmic Modeling, & more.